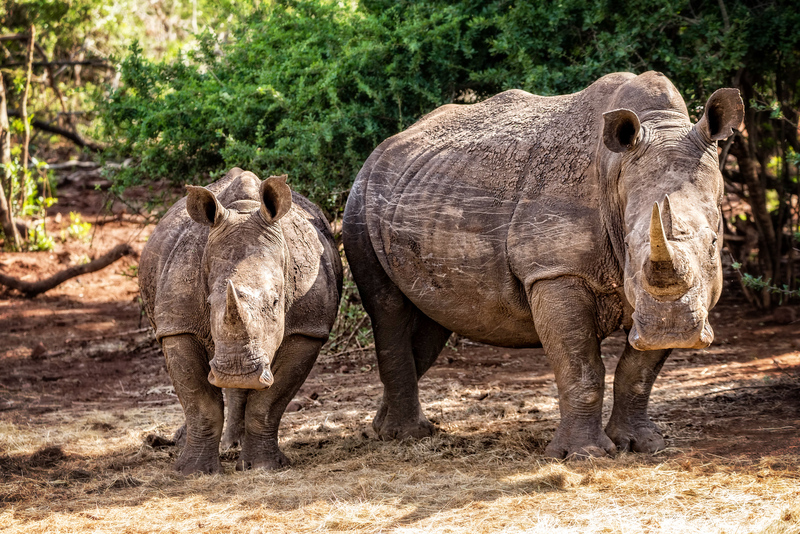 While we were in South Africa we were fortunate enough to see many white rhinos with immaculate horns – some of which may be worth up to $300,000 on the black market. For some reason the horns today fetch something like $60,000/kilogram and the adults have horns that weigh approximately 5 kilograms. The horns themselves are just made up of keratin – yes, keratin – the same exact materials that make up human finger nails, hair and horse hooves. Why does it cost so much? Tough question to answer but apparently in eastern medicine there is a belief that the horns are magical and can cure many ills and they also can serve as decorative handles for knives and other fine jewelry. Overall, it seems like an expensive price to pay for a ‘cure’ when I can just chew my finger nails and get the same medicinal effect? Unfortunately, the war on the White Rhino horn trade in South Africa is still ongoing to the point where the country recently (briefly) lifted their ban on domestic trade of the horn. It was reinstated but is currently under review and there is a chance that South Africa decides to lessen the penalties on trading the horn within their country. Clearly, this would be a negative development as hundreds of these animals are marred or killed each year WITH the ban in place. Imagine what will happen if suddenly the penalties for committing the crime and trading the horn are lessened. Only 4 days remaining to support our campaign, but we still have a log ways to go, as we only crossed the 50% mark in our goal. While we think we may still reach it, it does look like we just as well may miss it and this is for a great cause so if you have the ability and can spare some money to support it – please do! Plus, you will get a photo book with some great pictures (including one of mine) in it! All you need to do is go to this link (Plus One Collection III Charity Photo Book) and select your level of support. The Tongass National Forest in Southwestern Alaska is the largest national forest in all of the United States and is the largest temperate rainforest in the entire world. Alaska was nothing like I imagined it before heading to the great vast north. We didn’t go further north than Glacier Bay but I expected all of Alaska to be much like the ice planet Hoth in Star Wars. Instead it was more like the forested planet Endor that the Ewoks lived on during Return of the Jedi. Alaska was largely forest and the trees expanded in every direction – we hiked out to the Medenhall Glacier and had the opportunity to hike on the face of it before repelling down into the ice cave. On the hike back, as the sunset, I tried to stop along the way and take pictures of the lush green forest. I didn’t have time to setup my DSLR so I had to take this, and other pictures, with my point-and-shoot camera (Nikon All-Weather Camera). Given the speed of the water I was able to get some decent motion blur in a very short period of time (1 second or so). The most challenging aspect was trying to keep the camera steady throughout the shot – I had to balance this on a log, with a rock behind it. After many trips to Banff National Park I was finally able to visit the abandoned coal mine in the Lower Bankhead region of Banff National Park. The coal mining began in the early 1900s and the mines produced a half million tons of coal annually. Today the area is largely abandoned with the exception of bears that patrol the area often. There is a big parking lot at the unmarked trailhead to get down to this area but the past two years I haven’t been able to hike down to this area because of heightened bear activity so they had posted large (and scary) warnings about what could happen if you hiked down there and encountered a bear. By the way I received BIG news the other day that I’m going to have a photo published in an upcoming book for charity. The book is a collection of photographs from really great photographers around the world so this is a tremendous honor for me and I am so happy that my photography was selected. If you are interested in purchasing the book (PDF, Hard Copy, etc…) you can go to the website and purchase it. They are about halfway to collecting the funds needed to support the charity and print the hard copies of the book. I really hope we get there (not only for me to see my photo published – partially of course) because Eliza’s story (the adorable four-year old who the fundraising is supporting) is really tragic and she unfortunately she may not live into her teens as a result of a disease called Sanfilippo syndrome. I couldn’t imagine going through what this family is – but Eliza seems to be enjoying and making the best of her life – no matter what the future holds. Mitch Albom came out with a new book this week called The First Phone Call from Heaven. It tells the story of a town of people that starts getting phone calls from the afterlife and the joy in hearing that persons voice one last time. Enjoy the times you have and make sure you are living every day to the fullest because you can never be sure when your clock may be punched. I’m going to start reading it this weekend and I’m sure – like all the Mitch Albom books I’ve read I’ll highlight a number of passages that are significant to me. The one above was one that hit me because the fear of death paralyzes me at times and at other times it makes me go faster so that I can fit more into a day – but what is the quality of that day. When we rush through things and just tick the box what have we really accomplished? The mountains settle me – they have since I was 25 and made my first trip to Montana. There is just something about the significance of them and the fact that they’ve been around for millions of years that makes the whole tick the box thing just seem foolish. I’m planning our upcoming trip to Belize in April and trying to build in more ‘down’ time for my wife and I. It’s a struggle for me since I do still have this innate desire to see everything but I know for a fact the memories I make are much sweeter when I slow down and breath a little bit. An early morning look at the Continental Divide at Sprague Lake in Rocky Mountain National Park. This was the first time I’ve ever been to this lake for sunrise that I didn’t run into any other photographers – most of the time there are five or ten other people walking around and trying to find a shot but for whatever reason on this particular Saturday the lake was all mine. I spent the majority of the morning on the Continental Divide side of the lake shooting back at the rising sun but worked my way over to this spot just prior to the light getting too harsh to get any decent shots of the mountain. A few winters ago I tried to take a picture of this bridge – it was winter so the stream wasn’t running nearly as fast – and the snow made the image a little too bright. I’ve shot it a few other times since then and have never been happy with the results. However, I kept coming back and kept trying different angles figuring I’d eventually get one that I liked. Harvey Pass is one of the best day hikes in all of Banff. Although it is challenging at around 15 miles round trip – with a total elevation change of nearly 3,300 feet – the views from Harvey Pass are worth the effort. We followed the couple sitting in the right hand side for most of the hike. They would pass us, we would pass them but eventually we wound up both stopping for a picnic in the same area. It was nice to sit, grab a bite to eat and then start the hike on the way down – which was much easier. I watched ‘Into the Wild’ this weekend as I’ve always been a fan of the book and just recently realized that it was available for streaming on Netflix. So many people live within unhappy circumstances and yet will not take the initiative to change their situation because they are conditioned to a life of security, conformity, and conservation, all of which may appear to give one peace of mind, but in reality nothing is more damaging to the adventurous spirit within a man than a secure future. The very basic core of a man’s living spirit is his passion for adventure. The joy of life comes from our encounters with new experiences, and hence there is no greater joy than to have an endlessly changing horizon, for each day to have a new and different sun. If you want to get more out of life, you must lose your inclination for monotonous security and adopt a helter-skelter style of life that will at first appear to you to be crazy. But once you become accustomed to such a life you will see its full meaning and its incredible beauty. As someone who wasn’t happy with their circumstances and made a change I do believe completely in this. We all have the power to change – change is difficult and it isn’t always simple but for those that push through and see it through it is very worth it because if you live in an unhappy place what is the point of living. For everyone who criticized Chris McCandless for taking off and heading into the woods at least he took a shot – sure there were things he could/should have done differently and he paid the ultimate price but isn’t there something to be said for doing what it is that you love – even if it kills you? I mean, maintaining the status quo just kills most people slowly anyways. If you aren’t busy living you are busy dying. Now, waking up hours before sunrise and hiking to Emerald Lake isn’t exactly going into the wild but there is something to be said about getting away from it all and just being on your own. Seeing the sunrise without anyone else – heck probably not anyone within a few miles. There is peace there and each and every time I see it I can understand why McCandless felt that joy did not simply emanate from human relationships – but rather it is found all around us….like in a sunrise over Emerald Lake in Rocky Mountain National Park.